Product prices and availability are accurate as of 2019-04-12 10:26:00 EDT and are subject to change. Any price and availability information displayed on http://www.amazon.com/ at the time of purchase will apply to the purchase of this product. 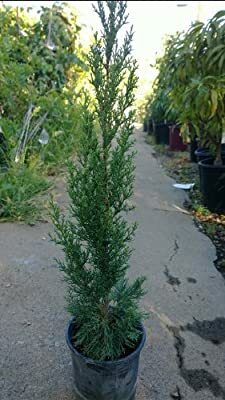 Italian cypress is an outstanding Mediterranean classic with attractive blue green foliage, with this offering grown by Monrovia nursery, the best grower in the trade. This easy care conifer will dominate a landscape with its densely branched, narrow columnar form. Evergreen. Full sun. Fast grower to 60 to 80 feet, about 3 feet wide or clip to shape. Makes ideal screen, and invaluable for something tall in very narrow beds. Hardy to USDA zone 7 and all higher zones. Gives great Tuscan effect if used in large containers on sunny deck or patio. Try it near swimming pools. Shipped as a potted one gallon tree in its original soil and container.